Amerikaner is a cake-like cookie commonly featured in German bakeries for after school snacks. Vanilla flavored with icing on the bottom of the cookie and served upside-down, the history of Amerikanern in Germany is an interesting one. There are two theories of how they came to be named Amerikaner. Either they were brought to Germany by the GIs after the war, or they were named Ammoniakaner for ammonium hydrogen carbonate, or "Hirschhornsalz", which was used as a leavening agent. This seems like a stretch to many people. 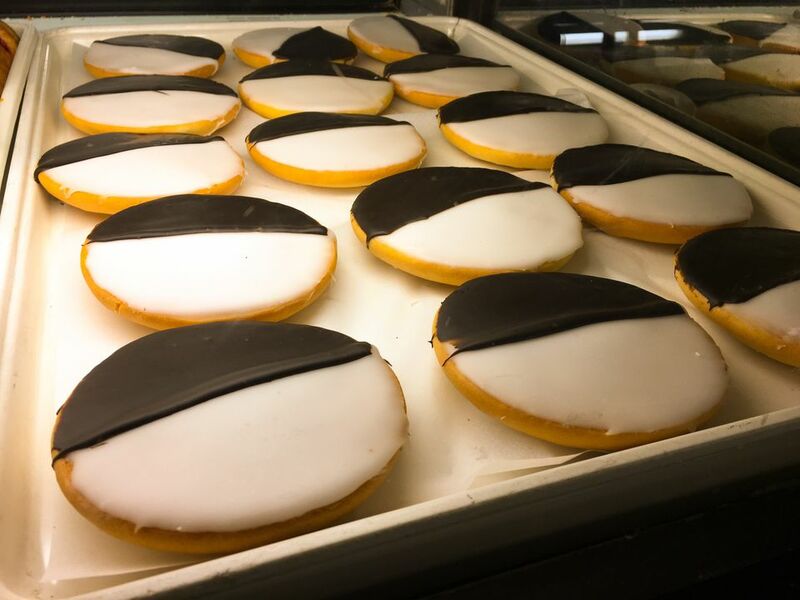 It is known that New York City has the same cookies called "Black and Whites" and they might first have traveled to the US with Jewish immigrants before traveling back to Germany. In the last decades, they have dropped the chocolate glaze in favor of an all-white glaze. Cream butter and sugar. Add eggs, one at a time, mixing thoroughly after each. Add 1 tablespoon of vanilla sugar or 1 teaspoon vanilla extract plus rum or rum flavoring, if desired. Sift the flour with 2 teaspoons baking powder, then add flour to the batter in three parts, alternating with the milk. Mix well after each addition. Mound about 1/4 cup onto a cookie sheet (about 6 to a sheet) and bake at 350°F for 20 minutes. When still warm, spread the underside with a glaze of powdered sugar mixed with rum and water. Second Option: spread one half with sugar glaze and the other half with melted chocolate glaze. Melt chocolate and butter in 45 seconds in the microwave, stirring every 15 seconds. Stir in powdered sugar, then add enough hot water to thin and beat with a spoon until the glaze is smooth. Checkerboard Cookies Are a Fun and Festive Treat! Make Your Own Dominos Christmas Cookies!